Happy Tuesday, friends! And, in case you missed it yesterday…summer is “officially” here! But I’m sure most of you already know this, due to the already-scorching temps. Especially if you live here in Texas. I am not complaining though, you all know I’m a summer girl through-and-through!! And 90-degree temps don’t stop me from using my oven, either. I mean, if it did, I might miss out on some delicious meals like this one!! 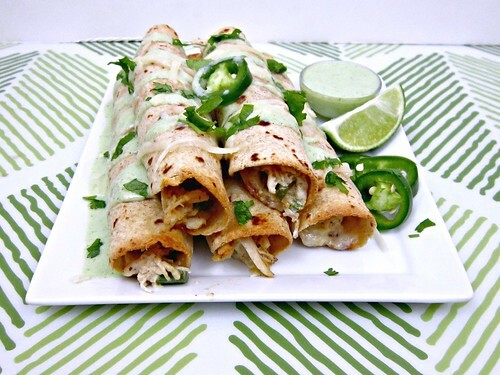 Jalapenos + cream cheese + chicken + taquitos + an amazing dipping sauce. Yeah, I’m not gonna pass that up just because the oven might heat my house up a bit. I mean, 10-15 minutes of oven time is a small sacrifice to make for a dinner this delicious. J and I went camping this past weekend as a belated anniversary and Father’s Day trip. I say camping…we went in a motorhome. A first for us both. And it was nice. And I was VERY thankful for that air conditioning, let me tell you. We got out to the park a little after noon and it was HOT. Like, I thought I was never going to get cooled off, after being outside for just a few minutes. And as I’ve said, I’m not one to complain about the heat. But good lawd! Maybe I’m feeling the effects of being 7 1/2 months pregnant in the summer?? I’m not sure, but it was miserable. So much so, that all the fun things we thought we’d go do at the park, we had ZERO desire to do. No hiking or fishing, we just went to the pool at the neighboring state park, which consequently was a VERY warm pool, and then back to the campsite to grill our dinner. Thankfully by that time it had cooled down quite a bit, so we could actually sit outside and not feel like we were melting from the inside out. And while grilling out is fabulous and the food is great, I’ll take my oven-heated-house with the air conditioning over standing over a hot grill in the sweltering heat any day. Besides, you can’t typically make taquitos on a grill now, can ya?!?! You could, however, grill the chicken outside if you were so inclined. I let J man the grill and I handle the inside cooking, when we do grill out, so I’m not the one standing over the hot grill. How do you divide up the cooking duties in your house? Or do you? I love a good taquito, and when it’s filled with shredded chicken, fresh jalapenos, and cream cheese, that’s all the better. And of course, the sauce. OMGoodness the sauce. It’s like adding a salsa verde twist to a classing buttermilk ranch. So, pretty much the best thing ever. Make these little tasties now, while you can still stand to turn your oven on for a little while!! Cook for 4-5 minutes per side, or until cooked through. Remove to a bowl and shred with two forks OR my preferred method, put in the bowl of a stand mixer and use the paddle attachment on medium speed to shred it for you. Return the chicken to the skillet, over medium heat, and add the cream cheese, jalapenos, garlic powder, salt and cumin. Stir to distribute the seasonings and until the cream cheese has melted. Meanwhile, preheat your oven to 425 degrees F and line a large baking sheet with foil. To make the taquitos, using one tortilla at a time, put a few tablespoons of the chicken mixture onto the bottom third of the tortilla (the end closest to you) then top with a sprinkle of shredded cheese. Roll the tortilla from the bottom up to form the taquito. Place, seam side down, on the prepared baking sheet. Repeat with the remaining mixture, cheese, and tortillas. Bake for 10-15 minutes, or until cheese is melty and tortillas begin to brown. While the taquitos are baking, add the sauce ingredients to a blender or food processor a pulse until smooth. Taste and add water if you want it thinner. Serve warm with dipping sauces and toppings if desired. This can also be made ahead and refrigerated, if you like. 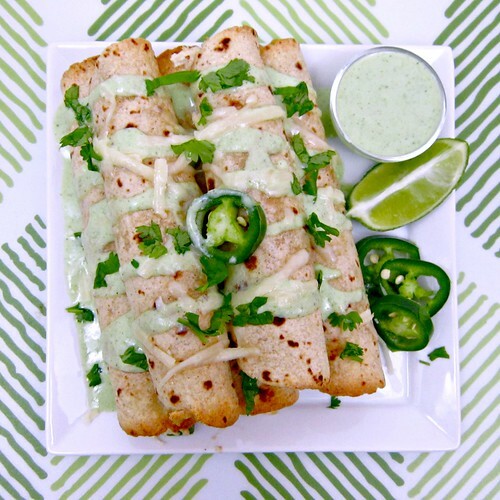 Serve taquitos with the sauce and extra jalapenos, if you like.